Motors are inherently highly reliable, requiring little routine maintenance. This remains true for most duties but may not be so where environmental conditions are aggressive, the starting duty is onerous, or high structural vibration is present. The same may be said of generators, with the exception that, as with all synchronous machines, particular attention needs to be paid to the excitation system. In general smaller motors of less than 5 kW and MOV (motor-operated valve) motors should only receive breakdown maintenance. However, MOVs shall be functionally tested at suitable intervals and it shall be confirmed periodically that their condition remains suitable for use in the area in which they are installed. 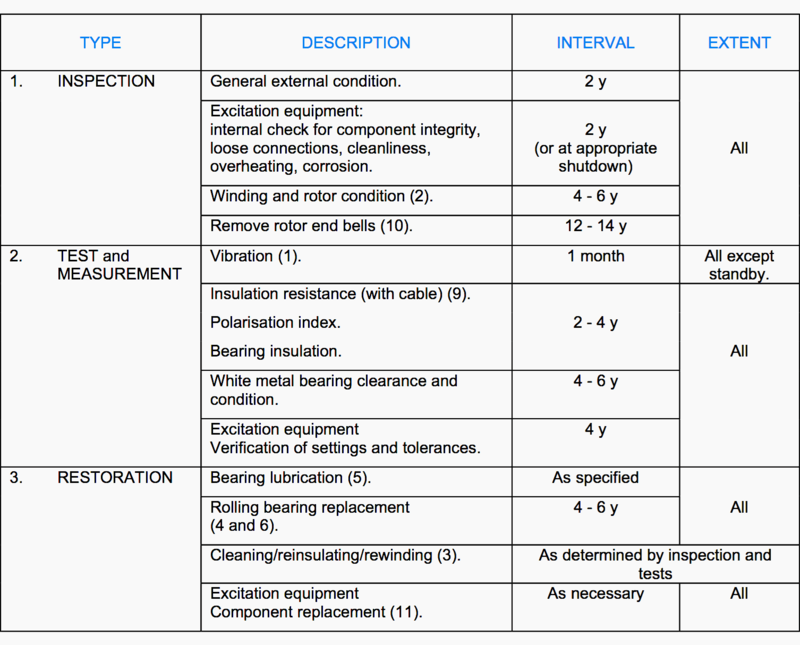 Motors may, depending on their duty or criticality, be selected for regular monitoring of bearing vibration. Particular attention should be paid to the Manufacturer’s recommendations for the lubrication of bearings. Roller bearings should not be overgreased, oil mist systems should be checked for correct atomisation of the mist, oil quality cleanliness and oil levels on white metal bearings should be maintained. Bearing replacement should be on condition, but may be timed to coincide with shutdowns depending on an assessment of the consequences of an unplanned outage. Bearing insulation should be checked in accordance with the Manufacturer’s recommendation. Internal inspection of motors will not normally be necessary, except for frequently started motors, essential motors, and synchronous machines where checks on the excitation system will be detailed by the Manufacturer. 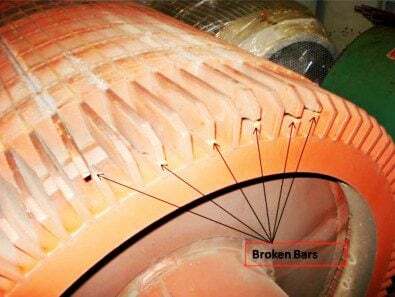 Checks on the condition of induction motor rotor bars and end rings should normally be scheduled to be carried out during bearing replacement. Coolers should be checked for leaks and blockages at plant shutdowns. 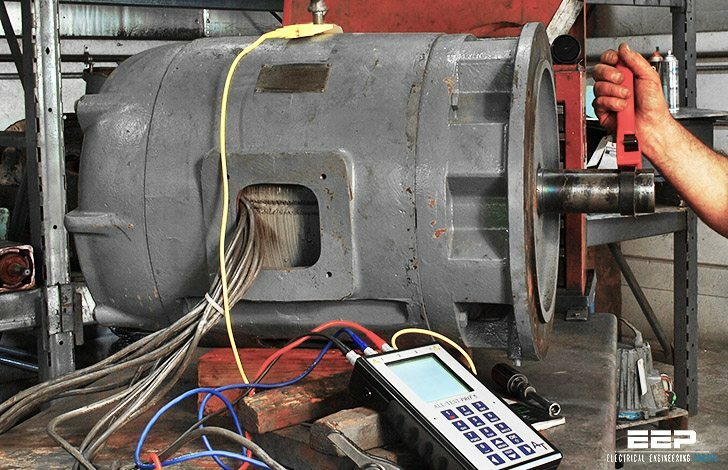 Winding insulation tests need only be carried out infrequently at a period based on site conditions, and timed to coincide with plant shutdowns. Such tests are best carried out from the associated switchgear to include the connecting cable. Practice #1 – For selected drives without integral vibration probes, bearing vibration may be monitored at the prescribed interval using portable instruments, e.g. Shock-Pulse-Meters for rolling-element bearings. Practice #2 – Inspection should be performed on a sample of HV machines, concentrating on those with the highest number of starts. Visual checks should cater for loose, cracked, or overheated components (including rotor bars, end rings, end bracings) and for leaks and blockages in cooling circuits. Practice #3 – Rewinding should only be carried out where economically and technically justified. 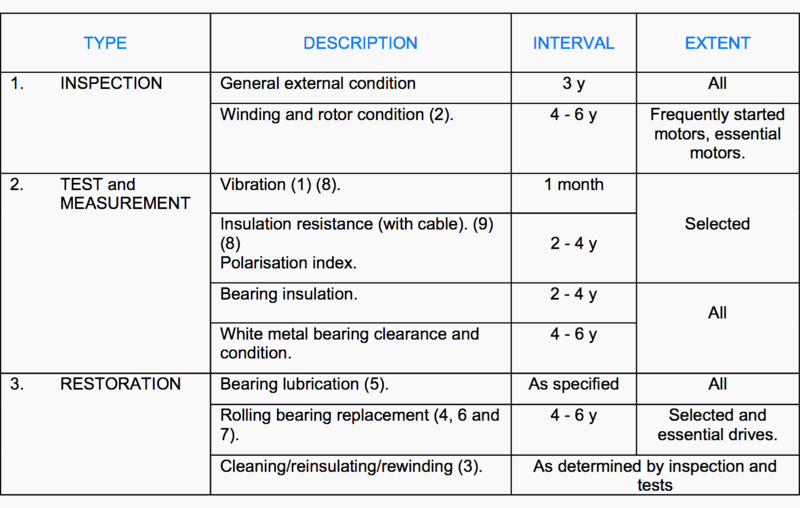 insulation quality tests consist of at least a HV pressure test at (2 x Vn) + 1 kV for 1 minute on each winding. Practice #4 – Bearings which have indicated reduced life spans during monitoring or by experience should be replaced on a time scale commensurate with their known service life. Such replacements may be brought forward to coincide with plant shutdowns. Practice #5 – Regreasing should be carried out in accordance with the Manufacturer’s recommendations. Practice #6 – Replacement ball and roller bearings should be C3 fit (clearance greater than normal) unless otherwise specified. Practice #7 – Plant operations should ensure that HV motors equipped with rolling element bearings are alternated at regular intervals in order to forestall the brinelling of bearings and to ensure the availability of the spare unit. Practice #8 – Test intervals/extent should be determined by the importance of the equipment and local conditions. Practice #9 – For recommended minimum acceptable insulation values see Appendix 12. For suggested action criteria see Appendix 1 and Appendix 2 (note that IR values are not necessarily indicative of winding remnant life). Practice #10 – End Bells should be removed and inspected for cracks, and rotor end windings checked for condition and tightness. This requirement only applies to steam turbines with end bells manufactured from type 8/8/5 Mn/Ni/Cr or 18/4 Mn/Cr steel, which are prone to stress corrosion due to the combination of humid conditions and type of steel. Practice #11 – Components nearing the end of their expected lifetime (e.g. electrolytic capacitors) should be replaced during the appropriate test and inspection activity. Reference // Field commissioning and maintenance of electrical installations and equipment // DEP 63.10.08.11-Gen. The above maintenance graphs & schedules are obviously a useful template or guideline, but they’re going to need drastic modification in some industrial environments. These can include an atmosphere laden with smoke (carbon particles), or brine (salt particles), either of which would have a drastic effect on insulation resistance – unless the motors were of a sealed (flameproof) construction. I suspect the only safe approach is to inspect/test initially at very short intervals – even if we’re convinced they won’t need it – and gradually extend these intervals in the light of experience at that particular site. DEAR EDVARD: AS AN ENGUINEER THAT HAS BEEN STUDYING FOR OVER 50 YERAS AND PRATICING THE PROFFESSION. what IS OUR REWARD OF SHARING OUR EXPEREINCE AND PRACTICAL WISDOM WITH YOUNG ENGIWEERS? KNOW THAT THE NEW GERNERATIONS DO NOT RESPECT THE OLD..